If you have been following this blog, you have seen me struggle to make the 208gr amax work in my rifle. I had all but written it off but I had 5 more bullets left from a box of 100 and decided, hey, what the heck, lets give it one last try. I loaded them up at .005 (JAM) at put 80gr of H1000 behind it. The next time at the range, while testing some Berger loads I finished up by shooting these into a 1.18" group at 200yards! I thought to myself, "No freaking way! This must be a fluke". But now I couldn't get it out of my head and just had to order another box to see how deep this rabbit hole goes. I am glad I did! DISCLAIMER/WARNING FOR NEW RELOADERS: This load data should be worked up to and is for ONE particular rifle (mine). If you try this load in your gun, it may not feed and worse, it may feed but blow up your rifle causing injury or death. Be very carefull when extending your Cartridge Length over the reloading book published values as there can be dangerously huge increases in pressure. Brass: Federal GMM Full Length Resized. I headed out to the range with 20 of these shiney new reloads just hoping that my previous experience wasn't a fluke! 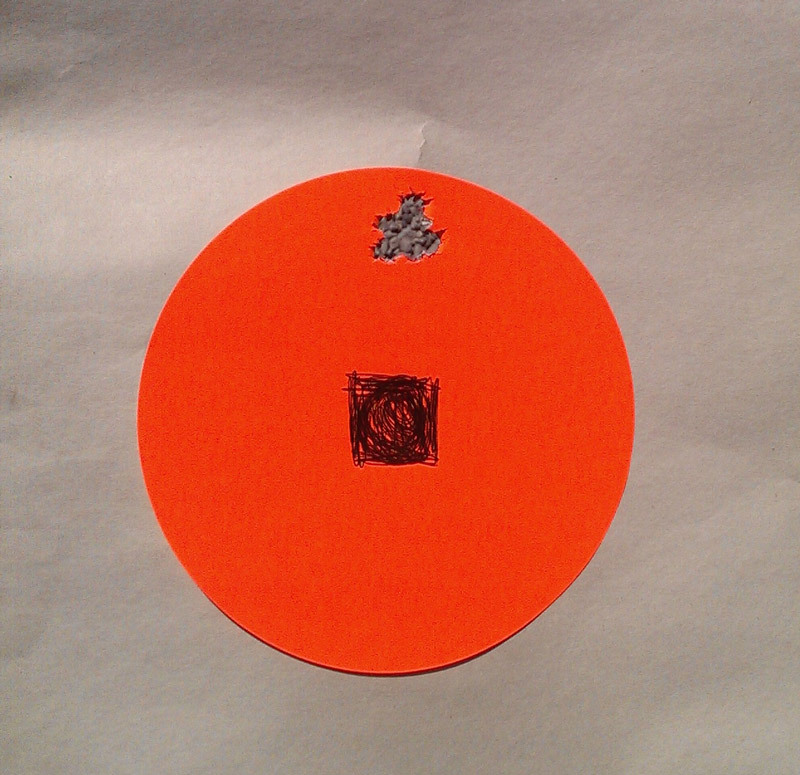 I fired all twenty rounds alternating between two 2" orange spots @ 200 yards. This provided me with two 10 shot groups. Time between shots was between 1 and 3 minutes depending on how distracted I was with the 50BMG set up in the spot next to me and the lady on the other side of me swearing about how loud my muzzle brake was. I think we took a couple 10 minutes breaks in there for target change as well. This is to say that the barrel was all over the place heat wise but it didn't seem to affect the outcome much. The end result was that I ended up with two 10 shot groups which were well under MOA. The group on the left was 1.625" and the one on the right was 1.7". Average velocity was 3010FPS. I am super happy about this. Ballistic calcs say this load is supersonic out to around 1 mile. Not sure that I need to shoot that far but still very cool to know! This blog covers two range sessions. Based on the article, I loaded up 3 loads for my 300 win mag. The article shows 4 but I already had data on one of the lengths so I didn't need to do that one again. 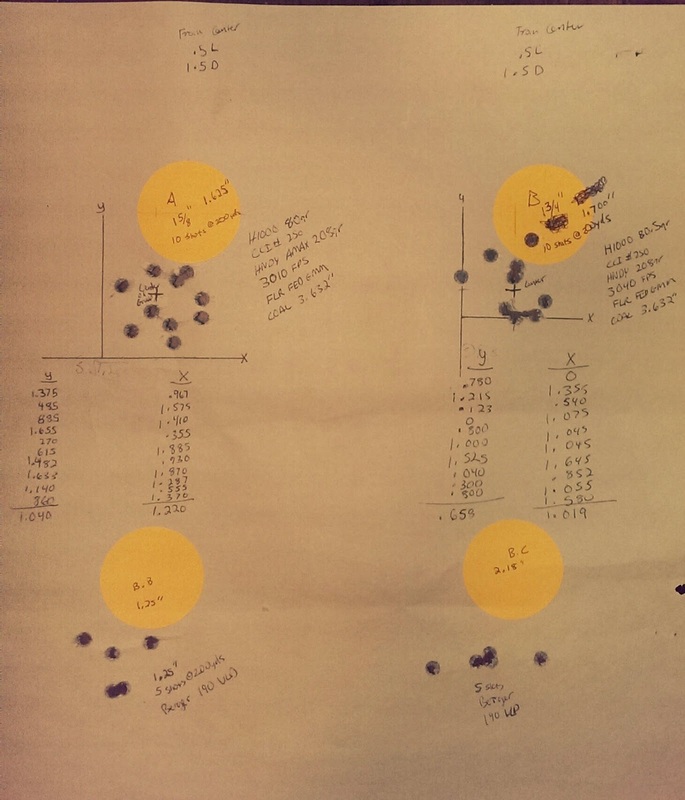 Also I deviated from the article in that instead of doing two 3 shot groups, I did one 5 shot group for each load. Here are the COALS I loaded. I previously had tried some loads at around 3.500 so I excluded the 3.510" load. All groups were fired at 200 yards. I setup 3 targets and alternated shots between the 3 targets. In other words, I fired one bullet from group A at target 1, then fired 1 bullet from group B at target 2, etc. This is to ensure that there is a fair accuracy comparison between the three loads. It also rules out changes in temperature of the barrel and external conditions (weather). Group A: 3" group Avg 2970FPS. Group B: 1.625" group Avg 2960FPS. Group C: 4" group Avg 2950FPS. Two things I noted, one which I didn't expect. The velocity went down slightly as the COAL was decreased. I expected the opposite to happen. I will have to read up on this a bit. The second was the drastic difference in accuracy between Group B & C. I was very happy with group B as it was roughly .8 MOA and a good starting point. I am very pleased with 1.25" group at 200yards. I don't see the need for any more expirementation at this point. All that is left for me to do is "prove" the load. What I mean by this is that I need to shoot a bunch more of this load to see what the actual accuracy average is. I do this by shooting a few 10 shot groups. I find a 10 shot group is much more telling about the accuracy of a load than a 5 shot group. Several 10 shot groups provide really good proof that the load is as accurate as I claim and not just a fluke or stroke of luck. I only loaded 5 rounds of each this time since that was the last of my 208gr amax. My results in the past have been dismal at best so just wanted to finish them off and maybe get one last stab at success. I had tried two different charges at the longer COAL and they actually performed well. My first group was with the 3.605 COAL and 78gr charge. @200 yards this grouped at 2.25 inches. Not terrible but not great either. My next group was with the same length but increase in powder charge to 79gr. This time my 200yd group was exactly 2" with a mean radius of .685". This is actually pretty good. The other thing I noticed is that the group tighted up considerably with the increase in velocity. There was a little sign of cratering on the primer but I think I could push this load a bit more and maybe tighten the groups even further. Unfortunantly I only have 5 bullets left of the 208gr amax. I guess I may have to order some more. I loaded these to have a jump of .017. I wanted to see if I could get a bit more consistency out of these loads. I loaded 15 rounds again and shot 3 groups of 5. My best group @200yds was 2.25". Actually I shot 2 groups which were 2.25 and a third which was 2.85". I had plenty of time and was waiting 3-4 minutes between shots to allow for barrel cooling. Conditions were great and temps were in mid 80's. I am a little depressed with these bullets so far but came across this article from Berger which gives me hope. Getting the Best Accuracy from VLD . I am going to give this a try and post my results in a few weeks (hopefully). But hunting season is coming on and I probably won't do much shooting during this time. This rifle seems to love the lighter bullets like the 155 and the 175 MatchKing. This load has worked pretty well in my rifle and I would love to find a heavier load which groups like this! I only loaded 5 of these and it was the very last group I fired for the day. The group @ 200yds was 1.25". This last weekend I decided to try some different loads including a factory loaded box of Federal Gold Medal Match 190GR SMK. My chronograph wasn't working correctly (maybe finally time for that MagnetoSpeed chrono! (http://www.magnetospeed.com)) so no FPS data this time. I started with the federal match ammo and right out of the gate things looked good! My first 5 shot group measured .650 center to center. The next 15 proved to be very similar although each group was consecutively larger. I noticed that as the barrel gun heated up, the groups elongated vertically. After burning up that $52 box of ammo, I decided to try some new reloads out at the 200 yard range. Federal 190gr GMM @ 100yds 5 shot group .650"
I had loaded up some more of the 175gr Sierra TMK and wanted to try those with a different powder. I had some success with the Superformance in the past but decided to try some H4350 this time. I was using full length resized PPU brass with CCI 250 mag primers with a 73gr powder charge and overall length of 3.6". I estimated velocity on these around 3100FPS. My first 5 shots at 200 yards measured just over 1.8". Not terrible but I think had I waited longer in between shots this group may have been even tighter. It was a hot day 104F and the barrel seemed to heat up quickly and cool down slowly. Again my next groups begin to string vertically, almost predictably such that I could aim lower each shot and get them to land in the same place. I wasn't really waiting in between shots and was probably firing about a round every 20-30 seconds. My gun seems to like this 175gr TMK so I plan on doing a lot more experimentation with this load in the future. I also shot some 2" groups at 200yd with 190gr VLD bergers with 75gr H1000. This was with the hot barrel too. So next time around will be trying that load with cold bore to see what we can do. I finally received a box of 175 TMK direct from Sierra and couldn't wait to do some more experimentation in my 300 win mag. I know these were mostly made to be a 308 match bullet but I figured the 300wm might like it just as well. If you have been following this blog, I bought a Savage 110 FCP in 300 Win mag and have experimenting to find a good load for this rifle. I have more than 10lbs of Superformance on hand and have been trying to see if I can come up with a long range load using it. There is little load data on the Superformance still and I think a lot of people are afraid to experiment with reloading. I have yet to use magnum primers with the superformance but those experiments will be coming soon as well. For now, i have been using CCI #34 and CCI 200 primers. I switched from the #34 to the 200's because I think the #34s tend to hide the early signs of overpressure. For example, I was seeing ejector marks before I was seeing primer cratering or flattening. This is because the 34 is a much harder primer designed for Semi-autos. I digress. After determining my max OAL for this cartridge which wsa 3.612 (on the lands), I decided to start with some longer bullets and some max "magazine" length loads (the longest load that fits in my magazine. The following were shot in 5rd groups at 100yds. These bullets seem to have a lot of potential in the rifle. I only loaded 5rds of each so the data is really only a starting point. One thing I noticed is that really all loads worked well. The speed was consistent and I believe the rifle cooling in between groups is why we didn't see much change between the 74gr load and the 75gr. The chart doesn't differ much if you input 3100fps as velocity. At 1500 yards, the velocity is 1128 vs 1164. I really don't plan on shooting much past 1000 yards with this rifle so really this is quite good. The next step for me is to load up a bunch and shoot some 10 and 20rd groups to see if this is really the load I want to settle in on. 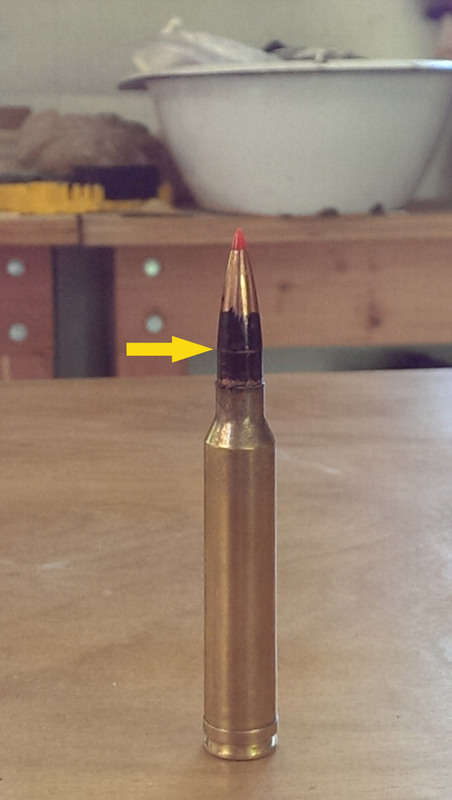 If you have been following this blog, you may have seen that for other than the SIE HPBT 155gr, and 175 TMK, accuracy has been dismal so far with this bullet powder combination in my rifle. Before I give up, I decided to play around with the COAL and see if things improve (usually they do). I took a measurement using the loose bullet technique . This is where you take a fired case and lube the neck, put a bullet in seated just enough to hold it in the case and then put it in the gun and close the bolt. It may take a bit more effort to close the bolt but shouldn't be forced. If you find you are exerting a lot of effort, you probably made the mistake of using a resized case (resized neck is tighter) or you forgot to lube the inside the neck. Another approach you can use is to just seat the bullet in a resized (unprimed) case and try to close it in your rifle. If there is any resistance, seat the bullet a little lower and try again. Keep going until you are able to close the bolt on the cartridge will little or no resistance. This should be close to your max overall length. The first method will put you just over the max oal (lands tend to dig into the bullet and you definitely don't want to load at this length). I usually back off this .010 and then color the bullet with a dark sharpee (see picture right) and put it in the gun again to see if it makes marks on the bullet ogive. If it does, I back it off another .010 and try again. I generally repeat this process until I can close the bolt on a cartridge without leaving marks on the bullet ogive. For my Savage 110 FCP, this measurement was 3.635". I then back off another .010 and use that as my starting COAL. My max COAL I record at 3.640 which is the length where this bullet would be lightly touching the lands. I always record this info in my reloading notebook since this process is a pain to repeat. I loaded 10rds at 3.625 which is way over my magazine length (3.510). I wanted to try a light load and a heavy load so I used my min (66gr) and max (72gr) from my previous test results. I expected that the velocities would be lower since I was seating the bullets out quite a bit (creating more capacity). Next I wanted to load to the max length that would reliably work in my magazine. I again made 10 rds at min and max powder charges using the COAL of 3.500. Things started off a bit rough as I my first 10 shots proved to be a WTF load. This is to say that groups were just over 4". Here is the data. In summary, the trend I noticed was that as I increased the OAL , accuaracy seemed to get better however, if velocity was not above 2800, accuracy was degraded. The best load which was with 3.615" COAL and 71.5gr Superformance showed a little sign of over pressure. There was some slight cratering on the primers on about 3 out of 10 shots. Here is a picture of those 3. You will notice a little cratering on the primer strike and some light circles on the "300" from the ejector. For now I am done playing with this bullet powder combination. I didn't seem to have much success without overpressure. The 208gr amax seems to do better around the 2900 - 3000fps mark and I just can't get there safely with superformance. I have had great results with superformance and 155s and 175s however and you can read about that in my other blog posts. I decided to give the 208gr amax a break for a weekend and try something different. I have a bunch of 30cal bullets on hand which I reload mostly for 308 and 30.06 and thought I would give some a try. I decided to do some minimal loads and see what velocities I got. Again because superformance has a similar burn rate to Winchester Supreme 780 and I had load data for that powder (courtesy of Hodgdon Reloading Center) and used the minimum charge as the starting point. I tried two loads this time out. The first was with Sierra 155 MK HPBT. I used 75gr of Superformance which according to the load data I had, should generate velocities between 2900 - 3000fps. Again I used PPU brass and CCI #34 primers. This was the second time reloading these cases and they were neck sized only. 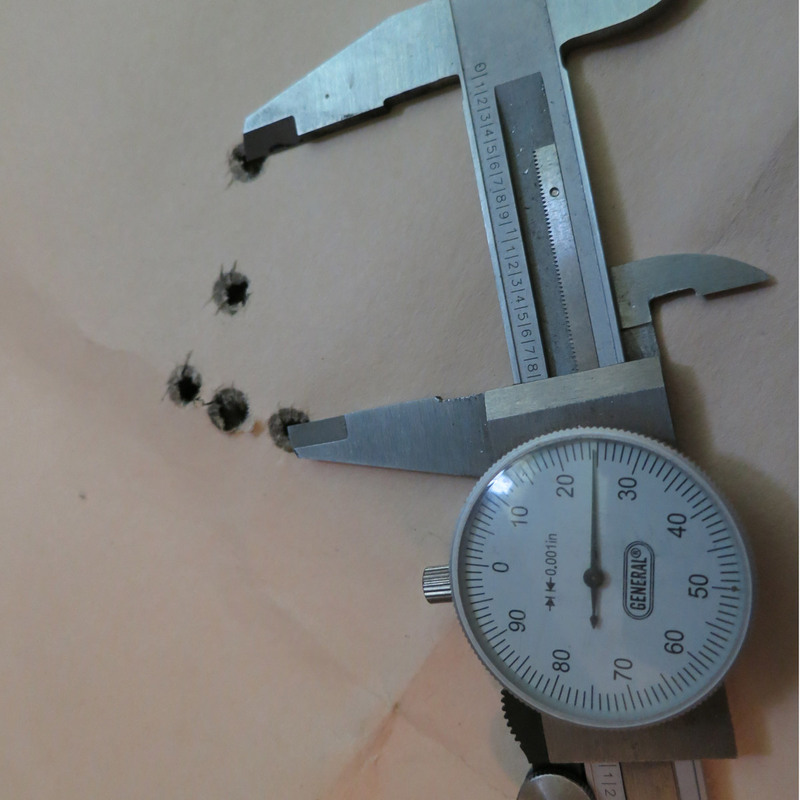 The second load was 168gr Amax with 72gr of Superformance, PPU twice fired brass and CCI#34. At the range I started with the 155gr first and was completely shocked at how far off my estimates were. So after firing the first shot, and looking at the Chrony, I thought either I made a huge mistake or the Chrony was broke. I checked the brass and there was no sign of over pressure. I continued on. The group sizes for the first two 5 round groups were .9" and .7". Now that's what I am talking about! The next 10 produced a range of velocities between 3177 - 3211. Again great groups under 1". This was actually a total surprise because I was pretty sure that the 155SMK wasn't really made for that kind of velocity. Again, wow.. I was expecting to be around 2800FPS but this is crazy. 3200 was way hotter than I expected. Again, the brass looked great, primers were in good shape, no signs of over pressure. The only downer was that the groups sizes were 1.8" - 2". My rifle hated this load but I may tune it up or down a bit to see if I can get something to group. I have a box of SMK 175 TMK coming soon so looking forward to putting those down range with superformance as well. So far in my rifle, this stuff is turning out to be a super powder for 300 win mag (well at least in terms of velocity).